Aoife Walsh, James Patrice, Kate Moloney and Carlha Linares pictured as they stepped out to give a special preview of the latest in racing fashion for the launch of Galway’s 4 Galmont Hotel & Spa’s programme of activity for this year’s horse racing festival. To celebrate the unparalleled style and elegance of the Galway racing festival, The Galmont Hotel & Spa will be providing everyone the chance to walk the red-carpet and showcase their fashionable flair against a bespoke ‘flower wall’ back-drop. Each stylish selfie linked to the hashtag #GalmontRaceWeek will be in with a chance to win an exclusive overnight package to celebrate their sartorial success. 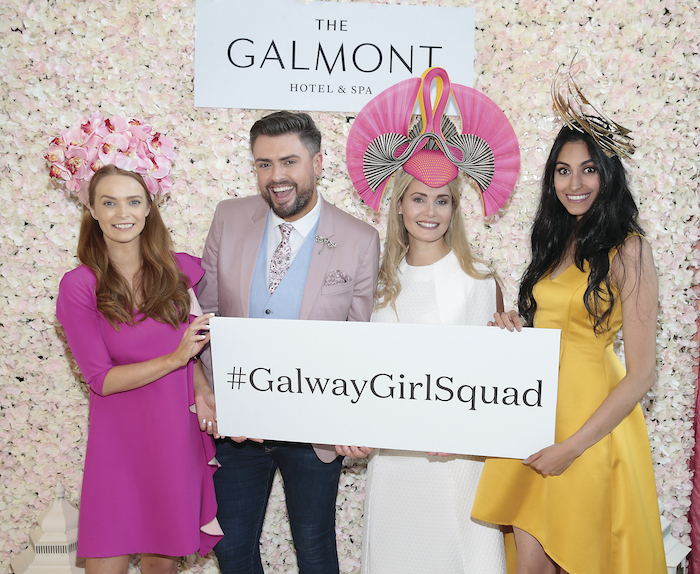 The Galmont Hotel & Spa has teamed up with personality, James Patrice, to pay homage to the famous fashion and style of the festival’s female friends by going in search of the ultimate #GalwayGirlSquad. Fashionable ladies, along with two friends will be invited to partake and be in with a change to each win 2 nights B&B, an exclusive dining experience and indulgent spa treatments. Furthermore, the winning squad will also receive an exclusive Galway Ladies Day package to include a Moët champagne lunch at The Galmont Hotel & Spa, tickets to the track and a reserved table in the Moët champagne tent. Ireland’s reigning most stylish man, James Patriece and his sister Vanessa Butler, will be on hand on Wednesday 1st August from 8pm to pick their odds-on favourite girl squads and choose the overall winners. For those looking to get race-track ready, The Galmont Hotel & Spa has launched the ultimate pamper package, including mineral make-up application, false eyelashes and hand file & polish for only €60. This package is the perfect finishing touch for the most stylish of ladies before heading to the races. Throughout race week, The Galmont Hotel & Spa will play host to a range of live entertainment and music acts. The place to be all throughout race week, The Galmont has an exciting line-up of entertainment to make Galway's biggest week even more fun. Enjoy nightly live music in Coopers Bar & Lounge including The Rascals and The Luna Boys live. Free entry will be offered to all to ensure that everyone has a winning night. An unparalleled dining experience will be on the menu every night throughout race week in the hotel’s newly renovated Coopers Bar & Lounge and Marina’s Grill, serving delicious local food and bespoke cocktails. On Tuesday 31st July and Wednesday 1st August, visitors are invited to indulge in an all-inclusive lunch and racing package, which includes a 2-course lunch in Marina’s Grill and glass of Prosecco on arrival, transport to and from the race track and complimentary entry tickets. On Thursday 2nd August, visitors are invited to savor a 4-course choice menu created by Executive Chef, Adrian Bane, in the AA Rosette awarded Marina's Grill, overlooking Lough Atalia.